The more the merrier in this party game and game producers accommodate their audience well. This trivia game features a high replay value, great customization and active participation in group settings for up to four players. This 20,000 question game has a special age customization in all three game modes. Categories include science, sports, entertainment, places & people, fashion, games, books and art. Players hit the A button and wave the remote up to answer questions. All the modes have time limits for answering each trivia question. There is a solo mode (time based sans the mini games), but the meat of the game lies in the group participation family mode and friends mode. 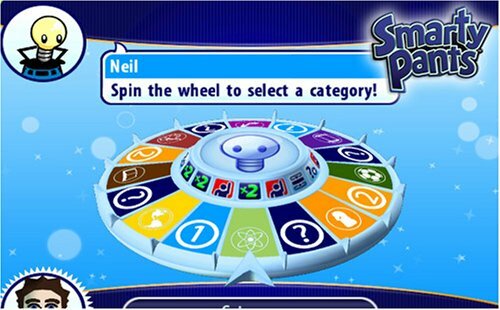 Both modes allow Mii use, which keeps close track of your statistics (only guest avatars are available in the solo mode) while choosing from a set of four multiple choice answers. Individual achievement cutscenes among gameplay can yield group celebrations/ridicules throughout the game. These elements also help maintain a pace that’s also suitable for all ages. The friends mode has a countdown (lose points from a beginning cache) or wager (play the shooting gallery for score amount). Players can also spin (and nudge) the wheel plus use challenge cards. All these activities utilize the Wii remote well. Players get put in “jail” (red bar visuals) when they get an answer wrong for five seconds, then they can answer again. Options include game length and character choice. The family mode options include amount of questions, timer speed and number of Wii remotes/players. This less competitive mode promotes team play and lots of interactive moves like tug of war and dancing. All the options and cards are basic, so most players (even the younger ones) experience a short learning curve. Players basically have to watch the visual icons and adjust their timing for better results. Trivia always builds learning, so this game adds the active mini games and the challenge cards which incorporate a wide variety of unpredictable gameplay. The spinning wheel nudging gets pretty easy after a while, so maybe future installments can include a variety option that would force players to “get out of their comfort box” categories and choose something beside entertainment or sports. The dancing moves and variety of questions can probably get most players out of their comfort box for some fun that exercises the mind and body. Plenty of opportunities for religion, history and/or food/health categories. A great addition for any Wii/trivia fanatic. This entry was posted in Video Game Reviews and tagged Michael Siebenaler, Mike Siebenaler, Nintendo, Nintendo Wii, Smarty Pants, Tall Writer, video games, Wii. Bookmark the permalink.